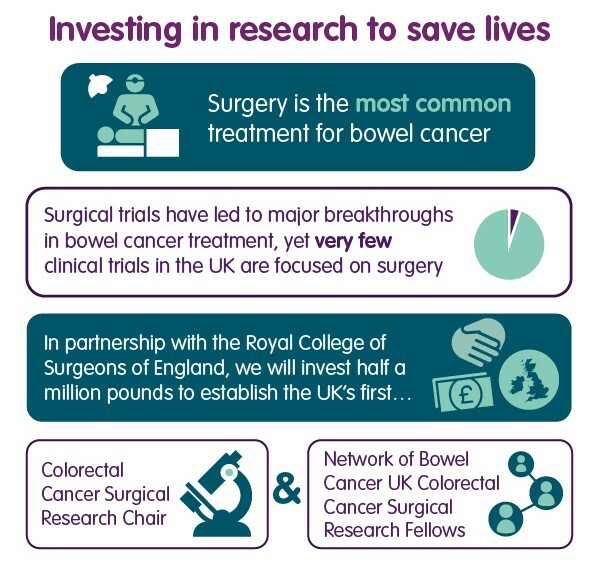 Today we, in partnership with the Royal College of Surgeons of England, announce £500,000 funding for bowel cancer surgical research to establish the UK’s first Colorectal Cancer Surgical Research Chair and establish a network of the charity’s Colorectal Cancer Surgical Research Fellows. This announcement comes ahead of International Clinical Trials Day on Saturday 20 May 2017. Bowel cancer is the second biggest cancer killer in the UK. However it shouldn’t be because it is treatable and curable especially if diagnosed early. Surgery is the most common treatment for bowel cancer and central to curing the disease, yet investment in surgical research is too low. Together with the Royal College of Surgeons of England we will establish the UK’s first Colorectal Cancer Surgical Research Chair in partnership with a University to drive forward the surgical clinical trial agenda for bowel cancer, increasing the number of surgical trials focussed on bowel cancer and increasing patient access to them. The partnership is also establishing a UK wide network of Bowel Cancer UK Colorectal Cancer Surgical Research Fellows to develop the surgical research leaders of tomorrow leading to continuous improvements in high-quality surgery for patients, which will in time save lives. Deborah Alsina MBE, Chief Executive of Bowel Cancer UK, says: “We’re thrilled to be working in partnership with the Royal College of Surgeons for our first investment in bowel cancer surgical research. This funding forms a key part of our new five year research strategy, which will be published later this year. Clinical trials are the bedrock of high quality medicine, and provide the best opportunity for making improvements in bowel cancer care. “Clinical trials are vital for taking potential treatment developments from research ideas to translating them into new drugs, diagnostic tests and surgical treatments for patients. Over the years surgical clinical trials have had a huge impact on improving the outcomes for people with bowel cancer. Most recently, we have seen great advances in using drugs and surgery in combination to help shrink the tumours to a size that makes surgery more likely to be effective at curing patients. Only surgical clinical trials offer us the evidence to know this is safe and effective. Professor Dion Morton, Director of Clinical Research at the Royal College Surgeons of England, says: “At a time when there are 100 new cases of bowel cancer in the UK every day, this funding could not come soon enough. Clinical trials are the bedrock of high quality medicine, and provide the best opportunity for making improvements in bowel cancer care.